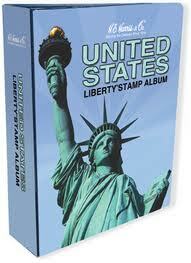 The Liberty Stamp Album has over 500 illustrated loose-leaf pages for U.S. stamps! A great album for any U.S. collector, from the novice to the experienced! Produced by H. E. Harris & Co. To order a stamp album, simply click on the stock number and add that item to your shopping cart! * Yearly Album Supplements are available for other years and many other albums. 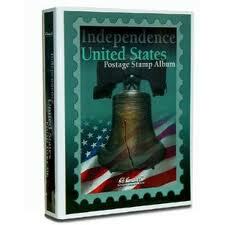 The Independence Stamp Album has illustrated loose-leaf pages for U.S. stamps. Perfect for a novice or young collector! 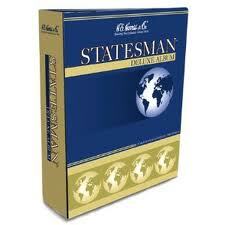 The Independence is also available as the Independence Kit . Produced by H. E. Harris & Co.
Each volume of the Statesman Stamp Albums has over16000 illustrations and spaces for over 18,000 stamps! A good album for collectors of all ages! Produced by H. E. Harris & Co. 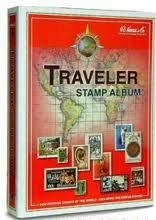 The Traveler Stamp Album has spaces over 10,000 stamps in a colorful loose-leaf binder. Great for the beginner! Produced by H. E. Harris & Co.
Much more to come !!! Copyright © 1997, 1998 - 2012 DeKalb Stamp & Coin Co., Inc. DBA Northlake Stamp & Coin, Atlanta, Georgia, USA.